Festival Au Desert: Music Of Peace Not Silenced By War For a dozen years, a music festival that highlights the music of Africa has been held near Timbuktu, Mali. This year, a nationalist uprising and ongoing battles made the Festival au Desert impossible. A new recording from the most recent event helps fans continue to celebrate the music. Tartit performs at the Festival au Desert. Tracks on a new live album of music recorded at the Festival au Desert include performances by Canadian-Indian singer Kiran Ahluwalia (backed by desert blues band Tinariwen), Afropop legend Habib Koite, Timbutku singer Khaira Arby and Touareg rock group Tartit. Long ago, one of my college history professors hammered home a durable truth: "If you love art," she said, "you should hate war." Because some art is always among war's victims. 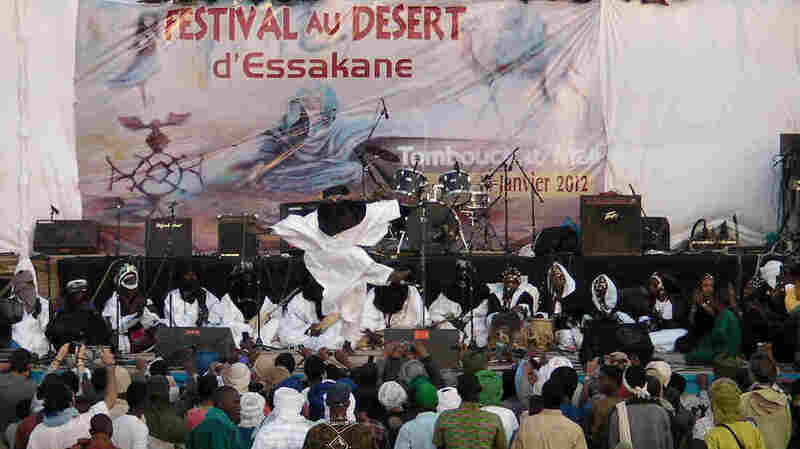 A case in point is a music celebration called Festival au Desert — held near Timbuktu, Mali, since 2001 — which I will Anglicize as Festival in the Desert. In January 2012, right after the last festival ended, a nationalist uprising began in the north of Mali, which was soon taken over by hardline Islamic fundamentalists. The 2013 Festival was canceled, and even a caravan-style mobile concert was deemed too dangerous. After intervention by the French and others, the conflict has cooled down, to the point where the Festival in the Desert may return next year. 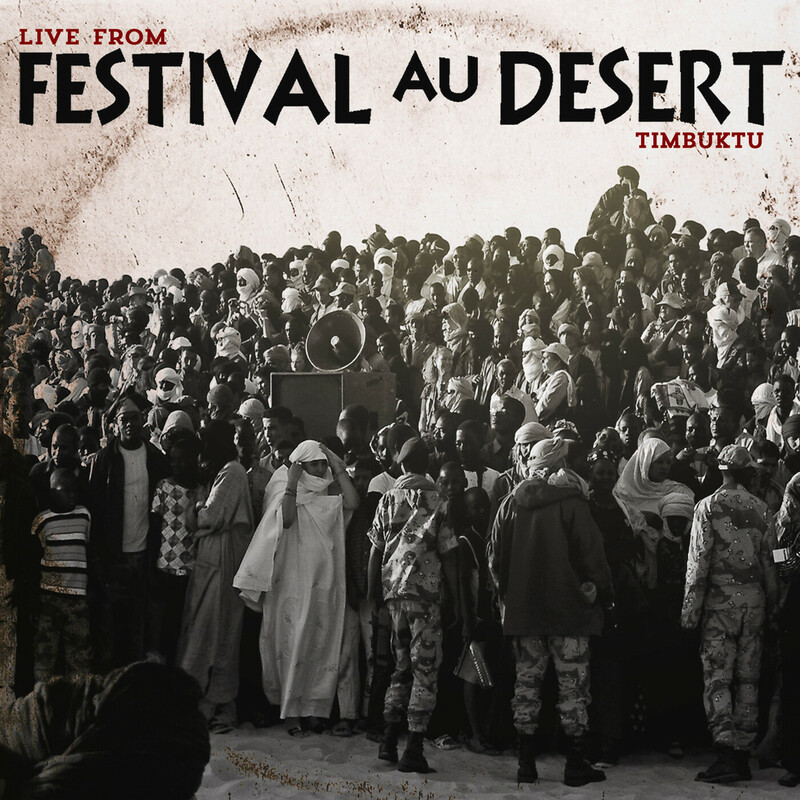 In the meantime, as a special souvenir of what was celebrated in Mali, we have a new record of the 2012 shows, titled Live From Festival au Desert Timbuktu. 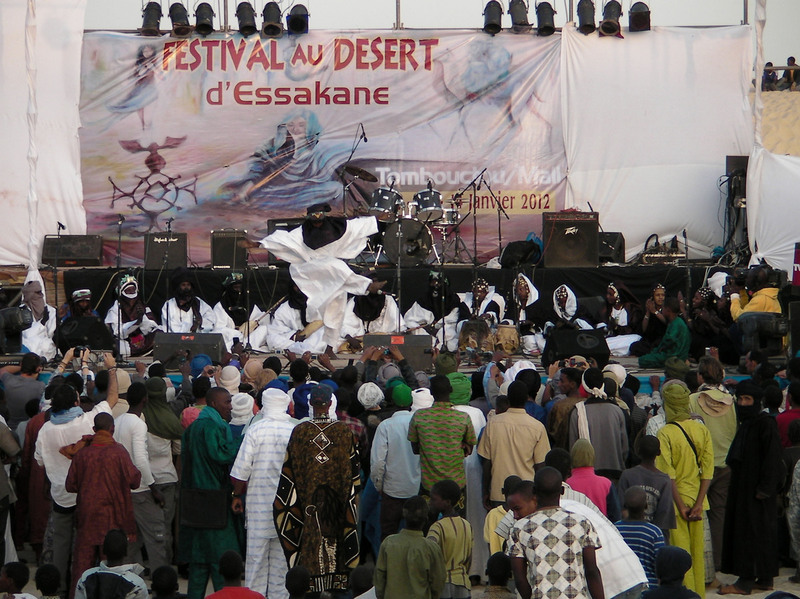 Although it was inspired by traditional festivals held by the Touareg people, the Festival in the Desert is a distinctly international symbol of modern Africa. Popular music has become a reliable export from many African countries, increasingly recognized as a force to bring diverse people together. Frequent guests appear from outside the continent. As is often noted, rock veterans like Bono and Robert Plant have attended and performed at earlier Festivals. That said, the folk elements of the music are a bit straight-up and unfiltered in the middle of Live From Festival au Desert Timbuktu. Pure voice-and-percussion works tend to leave me cold and make language barriers harder to cross; a track called "Traditional Chant" is one I skip every time through, though that's not more serious than walking away from a stage toward one you like better. Indeed, the voice-heavy "Odwa" is pretty crazed and, at less than three minutes, a song I would never skip. Elsewhere, swirling beats from full bands and strong singing voices erase all hesitation about exploring unfamiliar performers, though participating guitarist Habib Koite and the Touareg group Tinariwen have certainly found an audience in the West. Other songs here feature sentiments and themes with innate appeal and special resonance in the context of the Festival in the Desert — and its absence this year. One track simply praises "Democratie," while singer Khaira Arby goes for the most fundamental of all in "La Liberte." With luck, healing and progress toward resolving conflicts in Mali, there's hope for the future of the region. Certainly one landmark would be the return of the Festival in the Desert and its loud affirmation of peace and unity.